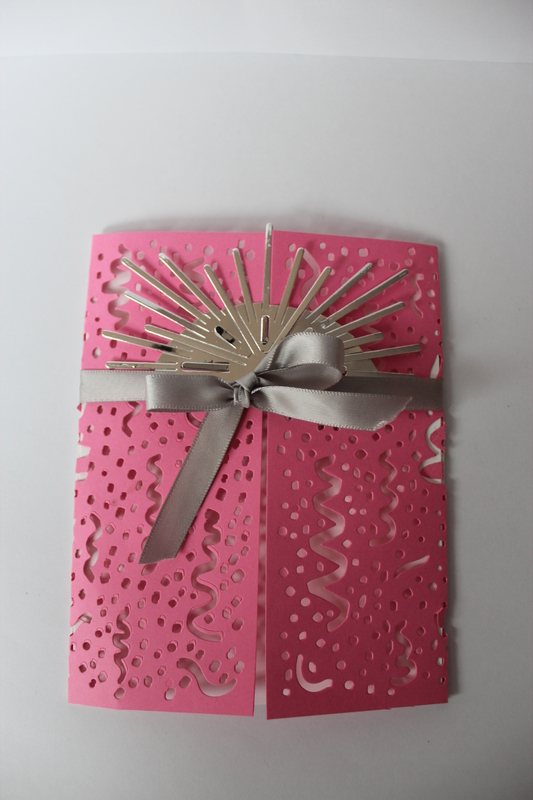 This week’s challenge at Papertrey Ink is to make a glittery mat for a card. I like it when these challenges remind me to take out a product that I haven’t used for a while. 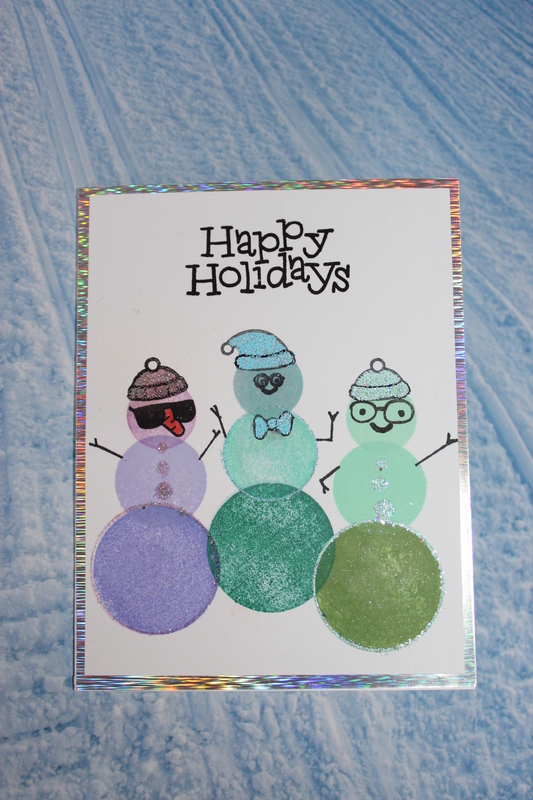 Lizzie used the white adhesive backed sheets from Papertrey Ink to make a glittered mat for her card. I think that I have only used these sheets to make stickers out of small stamps or dies so I wanted to see how they would work as a mat. 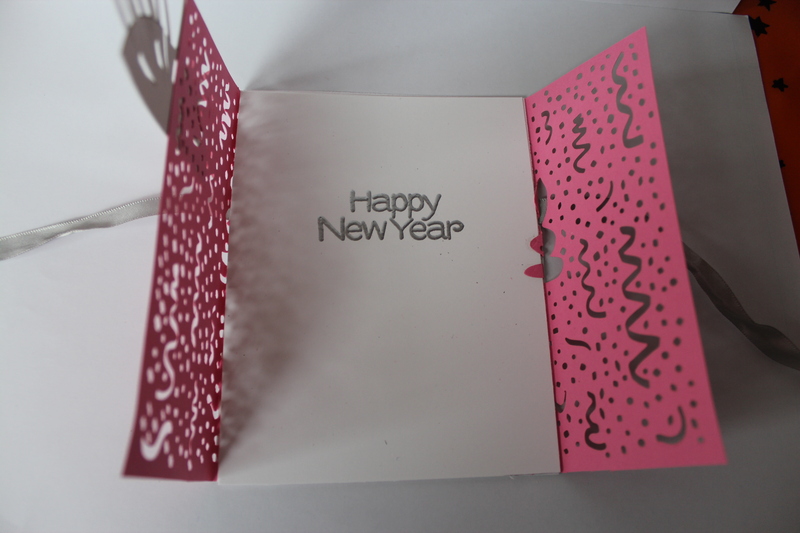 I was pleasantly surprised at how easy it was to make a card with a nice glittered edge. I would probably have dipped all four sides of the mat into the glitter and then attached it to the main image with glue or tape. Lizzie’s method of attaching the image to the mat first and then just glittering the edges worked quite well. I did have a small crises with the image wanting to go on slightly askew, but I managed to get it back off and straightened it up and reattached. While the paper is not heavy weight, it held up quite nicely, especially when I added foam tape to make the mat dimensional. I will definitely use this method in the future. Yesterday was the day for the fall crop put on by Scrapshotz online store. It is always fun to meet up with crafters that I haven’t seen for a while. One of my favourite stamp companies is The Ton, and Scrapshotz has begun to carry their stamps. 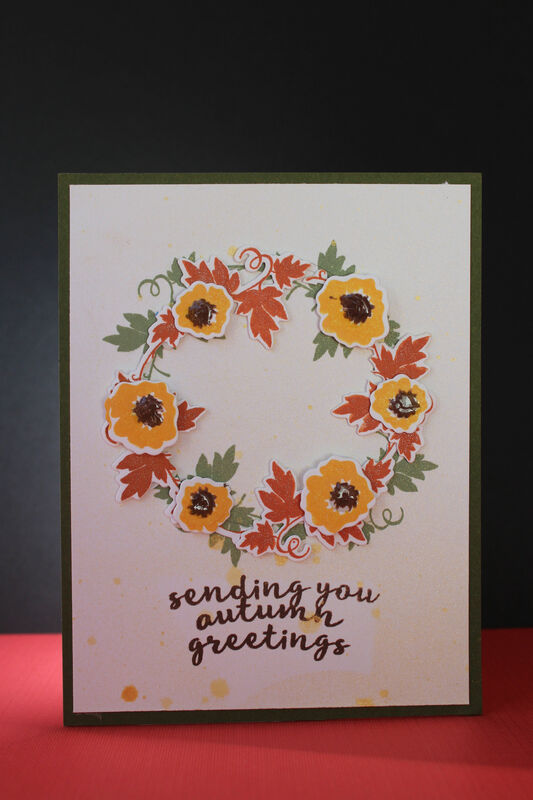 So today I am posting a card I made with one of many great The Ton stamps. I am not a watercolouring expert by any stretch of the imagination, but as someone pointed out, this large face stamp is a good place to start practicing. 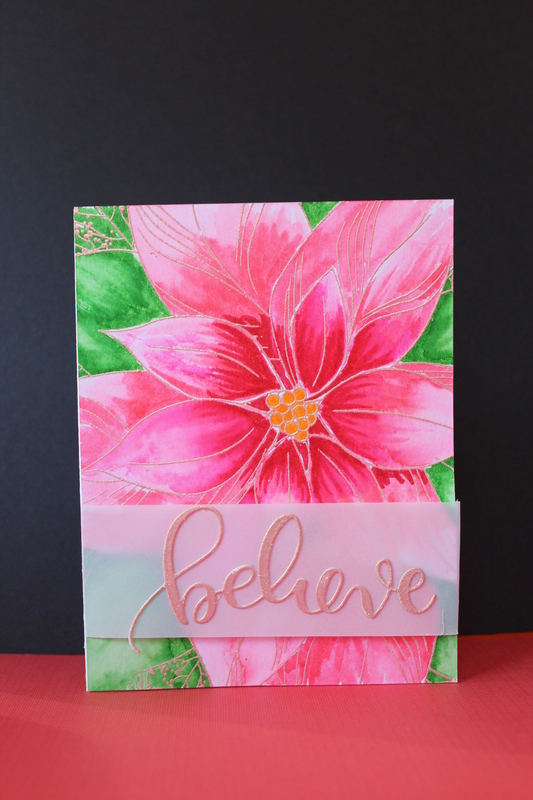 I used a rose gold embossing powder to outline the poinsettia which is also from The Ton. This week the challenge is to make a wreath. 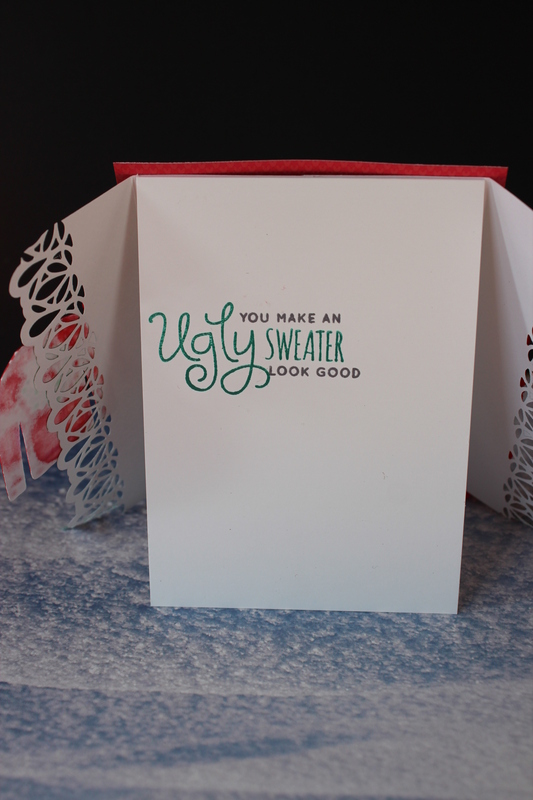 This is exactly the type of challenge that gets my creativity going, because I have no wreaths from Papertrey Ink. Nada….not one. That meant that I had to think outside the box…………er circle in this case. Tearing through every stamp set I had, I spotted a leaf spray from a Bleeding Heart stamp. It had a touch of a curve to it, so I thought I might be able to coax it into a circle shape. It is from the Make it Market Garden Gate kit. It came together very well, until that terrible moment, when I decided to add some dark brown splatters and black flower centers……………nope didn’t like it and had to start over. All is well, though, as the second time around I used a darker rust colour for the second layer of leaves and it turned out better. There really is something to be said for dress rehearsals. You do figure out what works and what doesn’t. I mentioned that there was unspeakable issues with my first attempt at this type of card. One of the issues that I could not overcome is that the design of the cover die resulted in very small pieces being left at the point where the lacy design folded over to the back of the card. There was no way it was going to lie flat and look nice. I may try it again using acetate behind the lacy parts to have something to glue the bits to, but for now that is a no go. Happily though I did a variation that will definitely get mailed to someone. As in Jennifer’s card there is a blank top folding card inside that a photo could be tucked into, or be used for the annual highly anticipated holiday letter where seemingly everyone but you has earned a new degree, went around the world or discovered the cure for cancer. Online Card Classes Merry Making- Day 3 Kristina’s Card. This card acted like many watercolour cards I have done. It was ugly, until suddenly it wasn’t. Probably still wouldn’t be the one I would choose to send to the Queen or even Prince Charles 🙂 , but it does have some charm. Funny how I needed triangles as my stamp again, but at least this one from Concord and 9th was adaptable to the task. 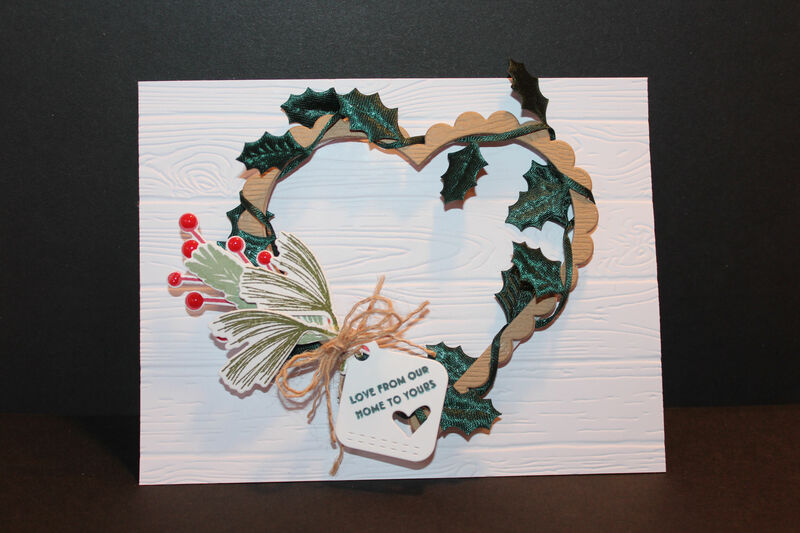 Online Card Class Day 2 Merrymaking- Shari’s card. 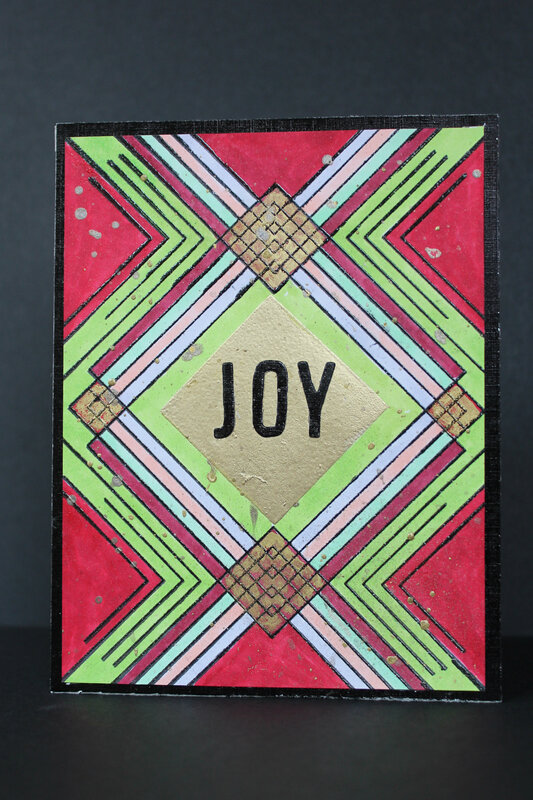 This card using the Paint Resist technique as demonstrated by Shari Carroll came together quite easily. I had a large background stamp of trees, so I decided to stamp this in Pewter Distress Paint. I then added the distress ink background wash and trees as Shari did in her sample. 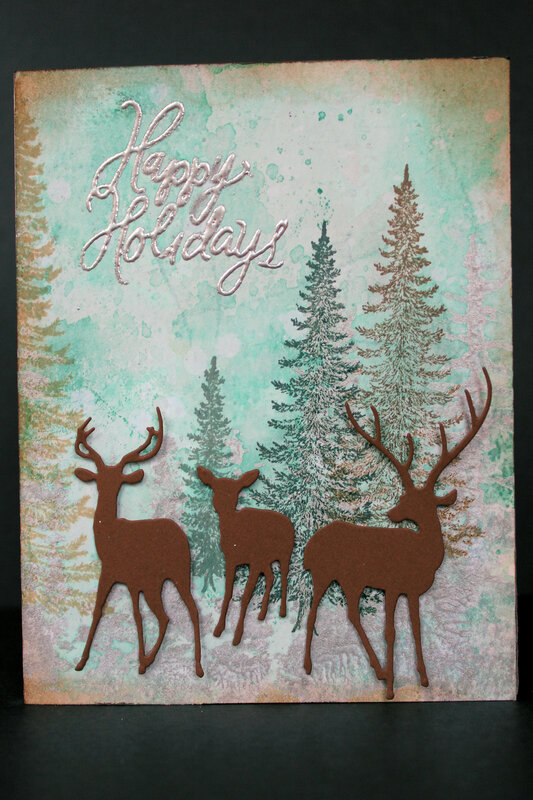 I added the diecut deer from Impression Obsession to the front of the card. If struggle and hard work ensures good results, then my card would be a Picasso. 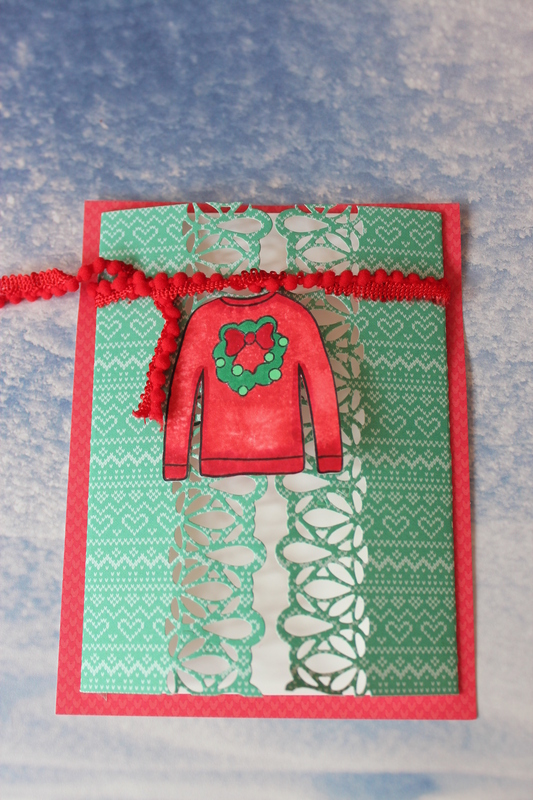 Working on this card is pretty much all I have done today, and my craft room mess emphasizes this. Trouble started early, when I realized that I didn’t really have any stamps sets with triangles on them for trees. In fact, the only stamp set I had with varying sizes and solid and outline images was my circles set from Simon Says Stamp. No problem, I say to myself…………..I will make snowmen instead of trees. 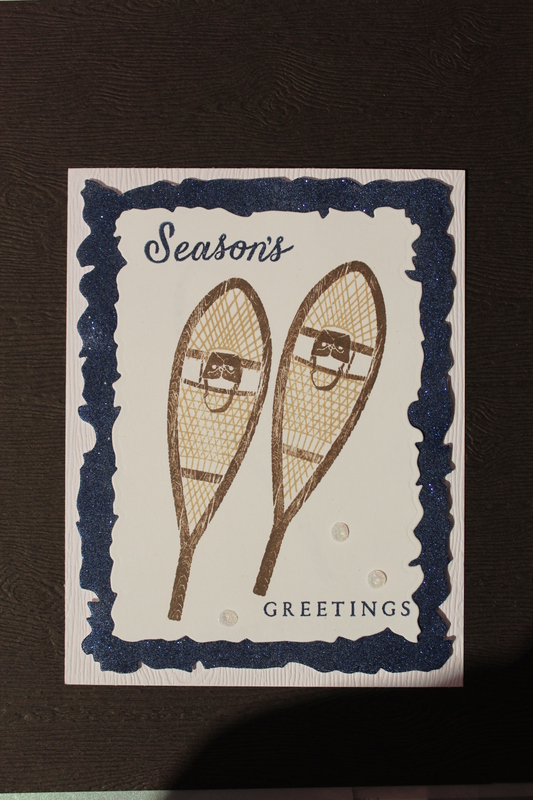 This proved problematic as well, as the graphic elegance of Laura’s card was impossible with snowmen as the image. They are just cartoonish, and that is all. No problem, I will make a fun version of the card. More problems arose with ink selection, blah blah blah. I finally got the card made, albeit with much darker colours than I intended, but then I went to embellish. I found great little hats in my stash, but they were too big for the snowmen heads. Yikes. I started over, this time picking snow man heads that fit the hats and worked backwards from there. 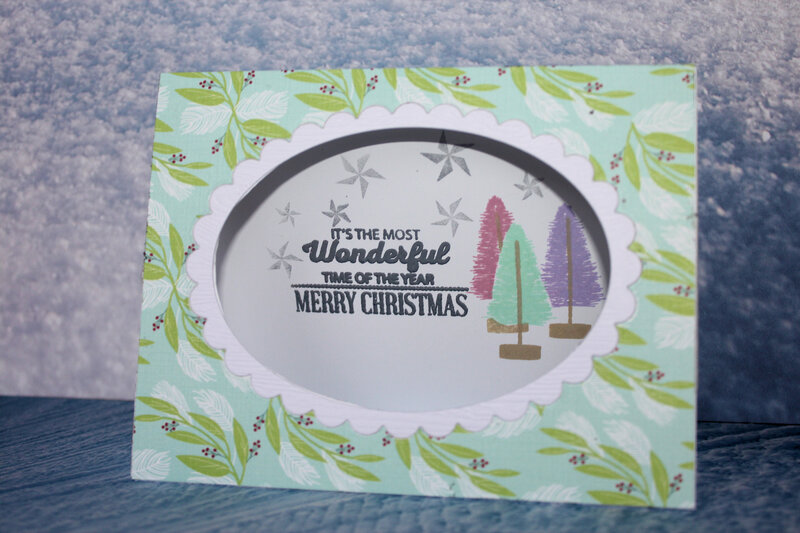 This time, I liked the results and the holographic cardstock that I used to frame the card finished it off nicely. The only remaining problem is that the camera doesn’t play well with shiny, sparkly things. The card is actually nicer that it appears in a picture.